From January 2019 Materials and Design will become an open access journal. Authors who publish in Materials and Design will be able make their work immediately, permanently, and freely accessible. Materials and Design authors will pay an article publishing charge (APC), have a choice of license options, and retain copyright to their published work. The APC will be requested after peer review and acceptance and will be required for all accepted articles submitted after 1st November. The APC for Materials and Design is US $2,000 (excluding taxes). Materials and Design continues with the same aims and scope, editorial team, submission system and rigorous peer review. Please note:Authors who have submitted papers before 1st November will have their accepted paper published in Materials and Design at no charge. Authors submitting papers after this date will be requested to pay the APC. For full information on publishing your paper open access in Materials and Design, visit the journal's open access page and guide for authors, or visit our FAQs page. Click here to find out more about Materials Today's Expanded Open Access options. Modern engineered materials play a central role in enabling technological designs that underpin, advance and revolutionise engineering practice. Materials & Design seeks to publish reports of materials research that present applicable advances in the insight into structure and function, and provide useable and reproducible recipes for the synthesis, preparation, characterisation, modelling and exploitation of new metallic alloys, ceramics, polymers, coatings, composites and bio-materials systems. Today's products and their constituent components and structures have to meet increasingly stringent requirements during operation. The economic and human costs of failure during service impose a great deal of responsibility on organisations and individuals who select and integrate materials in a final engineering design. A critical feature of successful product development is the judicious selection of the best materials based on informed awareness of the capabilities and opportunities afforded by all candidates, coupled with a design that takes full advantage of their properties. A further aim of Materials & Design is to promote a greater knowledge and understanding of the attributes and capabilities of all types of modern engineering materials in the context of engineering design. 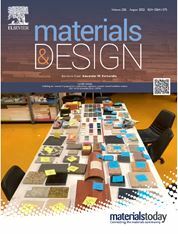 Materials & Design publishes a range of high quality peer reviewed research articles including full papers, short communications and technical reports, and occasional special issues, that investigate the properties of materials that influence or control any practical design. All types of engineering materials are considered, and all scales of processing, analysis and design from nano- and micro-scale devices and systems to large structural components. The content is broad and widely relevant to materials researchers, engineers and designers in academia and in industry. The emphasis is placed on developing both practice and theory relevant to the field of materials engineering and science, with appropriate links established to processing, characterisation and simulation. To reflect the multidisciplinary nature of design, submissions to Materials & Design should offer information useful to professionals working in fields related to the immediate subject of the article. Materials & Design brings together the overriding interest in the inherent architecture of solid matter with the practical need to know and use its properties to perform certain roles in service, either structural or functional. In reflection of this title, the journal is focused on the studies of natural and engineered materials, with particular emphasis on the elucidation of their structure and properties at all scales, from nuclear and electronic to amorphous and crystalline levels of organisation, to nano-scale and micro-structuring aspects, and ultimately to the manner in which this manifests itself in the suitability and performance of materials in various natural and man-made systems and applications. The editors of Materials & Design favour submissions that bring together experimental observations with modelling in a logically connected way that reflects the journal title. The combination of modelling with experiment helps elucidate the ways in which theoretical (analytical or numerical) descriptions of material behaviour can be turned into predictive tools to help design and applications.This does not mean that submissions to Materials & Design that contain reports of purely theoretical or experimental nature will be automatically rejected: editors reserve the right to accept submissions of either kind that report particularly novel and original approaches and results likely to make outstanding contributions to the field. For reasons outlined above, submissions split into multiple parts, e.g. Part I and Part II, are unlikely to be successful. Editors believe that a well-connected coherent piece of research should in fact incorporate multiple approaches and findings, and can and should be reported as one compact piece, in the form of an article. Ample provision is made by the publisher to attach supplementary material that accompanies the main text of the paper. To have a good chance of success, submissions to Materials & Design must identify and display clearly and prominently the aspects of novelty of findings, originality of approach, unusual treatment or experimental setup, unexpected discovery, etc. This means that the application of methods and techniques previously reported in this journal or in other published periodical(s) to similar or somewhat different materials systems or situations does not qualify for consideration. The authors should note that in this sense the frequently advanced argument of the sort "we recently published a similar paper in your journal" is distinctly counter-productive in terms of improving the likelihood of seeing their work in print. Papers must be written in clear scientific English that is well-structured and understandable to reviewers and editors without additional copy-editing. The presence of grammatical errors in the text may lead to submission being rejected at any stage in the consideration process, on the grounds of poor language impeding the understanding by the readers.